What Kind of (Dystopian) Trend is This? Anna Karenina. Leo Tolstoy. Translated by Richard Pevear and Larissa Volokhonsky. 2004, this translation. Penguin. 864 pages. Anna Karenina--big surprise--focuses on several families that are unhappy. These unhappy families are loosely connected with one another--some by marriage, some by friendship. The novel opens with Stepan Oblonsky and his wife, Dolly. Their marriage is in trouble--big trouble. But Stepan's sister, Anna, is coming to visit. She's not happily married either. (But her unhappy marriage is mostly stable. Therefore she is able to "model" how to be a wife.) He is hoping that Anna can talk some sense into Dolly. (She does.) During Anna's visit, she meets Kitty, Dolly's sister, and Alexei Vronsky, Kitty's suitor. Soon after, Vronsky drops Kitty. (Kitty who?!?!) He only has eyes for Anna Karenina. He follows her to Petersburg to pursue her. Kitty, of course, is heartbroken. She's lost Vronsky, someone she never really had in the true sense of the word, and Levin, Stepan's friend, who proposed to Kitty just days before Vronsky showed his true colors. It doesn't take long for these assorted characters to go their separate ways. The novel then takes turn visiting all these characters--all the while introducing new ones. Anna Karenina is a novel of contrasts. We've got the breakdown of a marriage as Anna begins an adulterous affair with Vronsky. An affair that destroys her husband and confuses her young son. Anna seeks her happiness in Vronsky, and she succeeds for a time. But it's happiness at a cost, with a sacrifice. She'll lose her son and her husband (not that she wanted him). She'll lose her social standing. She'll lose many of her friends and acquaintances. But she thinks it's worth it. For Vronsky, it's worth it. She loves him. This new relationship isn't perfect as we come to see. Readers will witness its destruction as well. The relationship between Levin and Kitty, on the other hand, is slowly developed. This marriage, though not perfect, works. Both respect and love one another. Both value the other. The two communicate. They say what they mean, and mean what they say. This healthy relationship contrasts with the dysfunctional relationships of Anna. To some extent, readers also follow the relationship of Dolly and Stepan. This is an unhappy marriage that--for better or worse--keeps working despite the disappointments and frustrations. But Anna Karenina isn't just a novel about love, hate, jealousy, marriage, and adultery. It isn't just about dysfunctional families. Just about every subject is covered at one time or another. These characters like to talk. They like to hear themselves talk. They like to argue. They like to debate. (They don't always like to listen to others that well.) They like to talk politics and government. They like to talk religion. They like to talk about social class, gender, and race. They like to talk about education. (Who needs it, who doesn't.) They like to talk about the land too. Almost more than they like to find answers, they like to ask questions. Is it better to be rich or poor? married or single? happy or sad? dead or alive? Is it better to live in the country or in the city? How much should money matter? What society should you keep? When is it acceptable to get divorced? How big a role (or how small a role) should a mother have in the lives of her children? How many children should a woman have? Is it okay to not want to have any more? I didn't love Anna Karenina. I did like aspects of it. I enjoyed certain chapters more than others. I don't find in-depth explorations of social change in nineteenth century Russia that entertaining. I don't find Levin taking joy in the physical exertion of mowing side by side with the peasants all that thrilling. (Or Levin's hunting adventures.) I did like the writing--at times. When it was more personal, more intimate, more about relationships, it was easy to connect with the story, with the characters. I didn't love the writing--the internal monologues--when it was about issues, when it was about "making statements" and voicing ideologies. It's a sad novel, but it's not without hope. 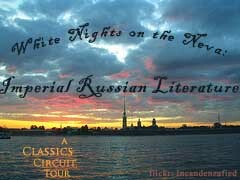 I read Anna Karenina for the Classic Circuit tour. I never did get too much out of this novel. I did, however, absolutely love War and Peace. Go figure. I loved Anna Karenina and really enjoyed reading it with my old classics book club probably about six years ago. It wouldn't have been as much fun to read it on my own! I need to read War and Peace one of these days. My husband loved it. I really need to read this one but I am so intimidated! I tried to get through this novel, honestly, I tried, but I just couldn't. Maybe now, with all the middle-aged insomnia, I should try again. I'm reading this book this summer with my College Students book club on Goodreads! I'm a little bit intimidated! I reacted much in the same way when i read this a few years ago: I didn't love it but I did like aspects of it. Thanks for sharing your thoughts! I'm about one third through Anna Karenina but I've put it on hold for now. It was a bit heavy and I'm a bit afraid of what will happen to Anna, she is so depressed where I am in the story and she is due with child any moment now. I enjoyed re-visiting "Anna Karenina" through your thoughts and comments -- I read it about 5 or 6 years ago (meaning pre-blogging, too). My main impression was how large the cast of characters was :-). the first 2 parts were so easy to read. the 3rd, 4th and 5th were boring. then again it was ok. the last parts are really good to read. actually i didnt like AK, because many parts /chapters r boring. but there some chapters that are really good to read. plus u learn a lot of the russian culture and mentality tru this book. in my opinion the novel is toooo long, some of the chapters r not really needed. u need to have a lot of patience to read it tru, as there times when u read and read and nothing happens. i really started hating Anna Kareina. She is a jealous, egotistic and manipulative person.